The country’s highest legislature was witness to unprecedented scenes when RJD and JD(U) members virtually came to blows in the Lok Sabha today, necessitating two adjournments and the target of the attack, Prabhunath Singh, tendering his resignation to Speaker Somnath Chatterjee. Even as Lok Sabha Speaker Somnath Chatterjee threw the resignation of Prabhunath Singh in the wastepaper basket, the JD(U) leader dared Union Railway Minister and RJD supremo to resign and face him in elections in Bihar. 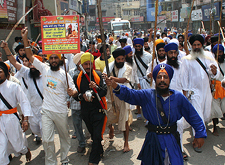 National president of the Rashtriya Sikh Sangat Gurcharn Singh Gill has claimed that the Rajasthan Government has agreed in principle to include chapters on the significance of turban and “kesh” (hair) in the syllabus at school level with a view to generating awareness among the non-Sikhs. The minimum support price (MSP) for paddy for the Kharif season has been raised by Rs 40 to Rs 650 a quintal, Agriculture Minister Sharad Pawar announced in the Rajya Sabha today. A little after 9 am today, when OPDs began functioning at the All-India Institute of Medical Sciences (AIIMS) here, anxiety was palpable in front of corridors, where patients awaited their turn, and inside, where a harried administration tried to ensure minimal disruption of services, as hundreds of resident doctors went on a mass casual leave. All 12 persons detained in Amsterdam following a security alert on a US airliner were Mumbai-born, Minister of State for External Affairs Anand Sharma said today. Breaking long dry spell, many parts of Punjab were today lashed by rains, with Ludhiana turning out to be the wettest place in the region. Ludhiana received 33 mm of rain and the maximum temperature there plummeted to 32.4 degrees Celsius, three degrees below the normal range, the Meteorological Department said here.